I love Final Fantasy. As part of my Final Fantasy Project I've been eyeing some of the spin-offs I want to visit or revisit from the series. 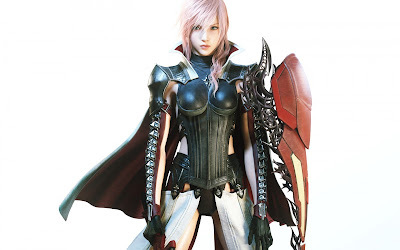 Lightning Returns - I liked FFXIII, although it wasn't my favorite game in the series. It had some issues, but it was still good. After finishing it I tried to get into the sequel, FFXIII-2 but it fell flat for me. I've heard great things about Lightning Returns, which is the third game in the series. I even own the game already. Since it's on my PS3 which has been moved to another room I've just never booted it up. I need to get around to it. FFX-2 - I think FFX is one of the best games in the series. It's the one I always recommend to new players who are interested in Final Fantasy. FFX-2 is the direct sequel and I remember enjoying the battle system a lot the first time I played it. I don't remember much more than that because it's been awhile and I only played the game once. Again, this is one that I own. I have the remaster sitting on my Vita ready to go. I just need to pull the trigger and start. Not to mention the Final Fantasy spin-offs coming out soon. I'm really excited that Final Fantasy Explorers is coming to the west and I'm super hopeful that we'll also get to see Final Fantasy Mobius here too. X-2's combat system is probably the best version of ATB SE has ever created, imho. The story isn't too bad, though if you want to do all the things it is a complete slog since you need to visit every area in the game basically 5 times. But if you ignore all the things? Solid game in my opinion. Lightning Returns, egh, XIII-2 I at least finished. I got an hour into LR and just couldn't keep going. Story was non-sensical over the top, and the combat system left me completely annoyed. Also, the time limit mechanic really turned me off to start with. I loved the X-2 battle system the first time I played the game, I just don't remember it much. It's been a long time. When I tried the demo of Lightning Returns I liked the combat but hated everything else. I don't know if that one's going to click with me or not. It seems like the storyline jumped the shark a couple times already.